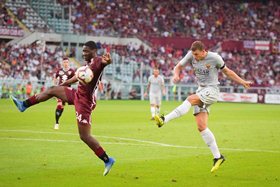 Ola Aina has been named in Torino's match day squad for the Italian Serie A clash against Inter Milan at Stadio Giuseppe Meazza (Milano) on Sunday evening. If the Chelsea loanee is included in the starting lineup by manager Walter Mazzarri, it would be his full debut after coming off the bench last weekend against AS Roma. Having said that, De Silvestri, who was replaced by the Nigeria in the first half against Roma, was included in the 21-man traveling party to Milan. Against the Giallorossi, Iago Falque's goal off a brilliant assist from Aina was ruled out as the Super Eagles defender was adjudged to be in an offside position by referee Di Bello in the lead up to the goal after the official consulted VAR. The 21-year-old has been called up for Nigeria's upcoming 2019 Africa Cup of Nations qualifier against Seychelles early next month.